Encapsulated round fibroid tumor of the uterus. Journal : American Journal of Obstetrics ; vol. xi. New York : William Wood, 1878. Description : 617-619 p., [1 l.] pl. ; ill., 1 photo. ; 23 cm. Photographs : 1 heliograph of a specimen. Subject : Uterus — Fibroid tumors. Cited : Rutkow GYp130 ; Burns, pg. 1246. Author caption: "..exhibited for Dr. Anna A. Broomall" (in-text). Read before the Philadelphia Obstetrical Society, April 4, 1878. Report presented to the Society by Dr. Albert Holmes Smith (1835-1886) on behalf of Dr. Broomall. 1871 graduate of Women's Medical College of Philadelphia. Appointed Physician in Charge of the Women's Hospital of Philadelphia, 1878. 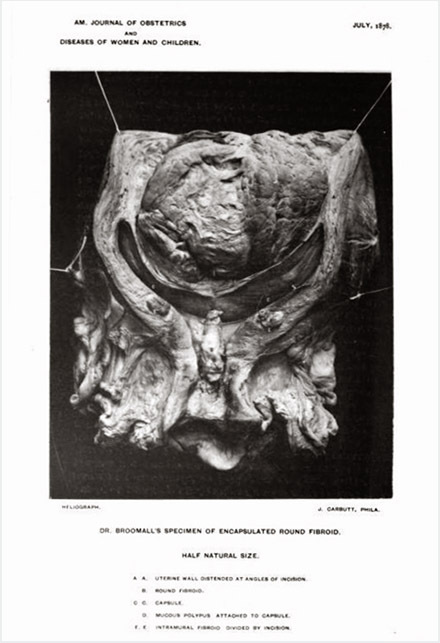 Broomall's specimen of an encapsulated round fibroid is shown in this early heliotype, taken by John Corbett [sic] of Philadelphia. It was one of the first mechanically reproduced photographs published in an American periodical. — Rutkow GYp130, and fig. 33. Broomall's monograph* on episiotomy standardized the procedure in America. Broomall also established one of the first prenatal care units in an American hospital and her stewardship led to a reduction of birth mortality that was noteworthy. *Broomall, Anna E. "The operation of episiotomy as a prevention of perineal ruptures during labor" ; Am. J. Obst. xi, 517-527 ; NY: Wood, 1878.